Gurgaon or now known as Gurugram has seen revision of its circle rate after 4 years. The new circle rates would be effective from February 12, 2018. Circle rate or Collector rate is the minimum price at which a property is registered when being transferred, and stamp duty from it is a major source of revenue for the government. The Gurgaon circle rates had remained unchanged for in 2014-15 and 2015-16 and was reduced 5-10% over the past two years. The HUDA sectors have been divided into 12 categories with circle rate varying from Rs 25,000 to Rs 50,000 per square yard. Sectors 27,28,42 and 43 have seen the highest increase from Rs 42,500 to Rs 50,000. 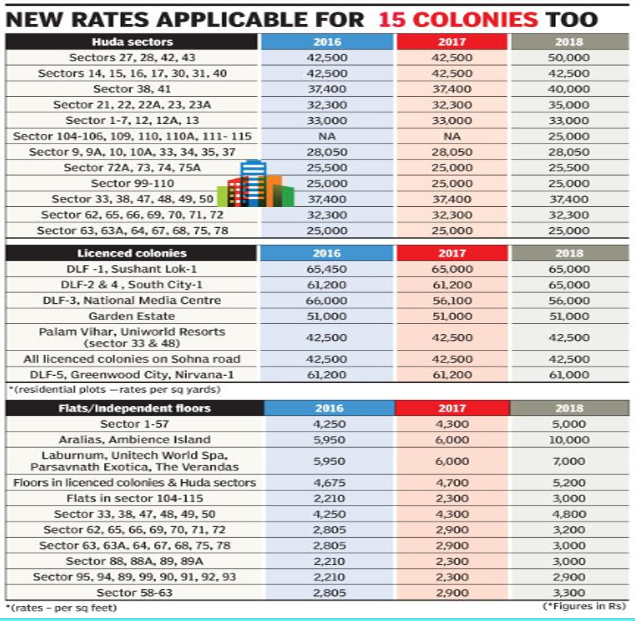 In case of licenced colonies, the rates for only DLF 2 & 4 and South City has increased from Rs 61,200 to Rs 65,000. For others there is no or marginal change. The circle rate for flats and independent floors have seen substantial rise for Aralias and Ambience Island from Rs 6,000 to Rs 10,000 per sq feet. The increase in circle rates for other areas are in the range of 10% to 30%. The new sectors of 89 to 95 have lowest circle rate of Rs 2,900 per sq. feet. Also, it has been decided to revise circle rates twice a year to keep the rates in sync with the market price. Though official say that the circle rates are in sync with market realities but that does not seem true for all sectors – especially plots. If you check the HUDA plot rates in Sector 40, the market price is in the range of Rs 70,000 to Rs 1,00,000 per sq yard but circle rates are still Rs 42,500 which is still substantially lower and encourages black money transactions. However, circle rates of flats seem to be more aligned to market prices.